When I arrived in Bournemouth from a railway point of view it was a different world from down in Devon. 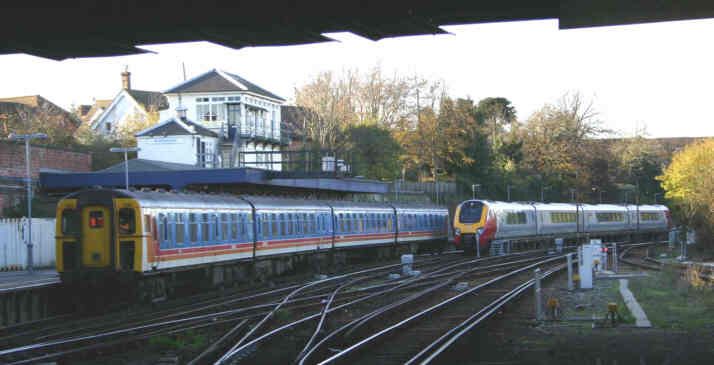 The line had recently been electrified and Southern Region electric units ruled the roost, with diesels confined to the push-pull working of the Weymouth portions of Waterloo trains, the odd inter regional services and freight. The frequency of the service was also a surprise, at first the Waterloo fasts ran two hourly (later they were hourly), the semi fasts and stoppers (4VEP's) were hourly. The fasts and the semi fasts (4REP's) in the hours when there wasn't a fast had Weymouth portions which were attached and detached in Bournemouth station, there were also Channel Island boat trains between Weymouth and Waterloo which changed between electro diesel and diesel locos at Bournemouth to add a bit of variety. The photos on this section cover from Weymouth (updated!) and run east to Southampton and Eastleigh, which for railway purposes was a distinct area. Some shots outside this area are included to show types of loco and stock that worked in the Bournemouth area, the last "section" is of steam engines ,(updated!) included for added interest. Photos not otherwise credited are ©2001-2004 S G J Huddy. Other photos are included with permission of the copyright holders.